For ninety years, Hollywood's brightest stars have favored the Chateau Marmont as a home away from home. An apartment house-turned-hotel, it has been the backdrop for generations of gossip and folklore: 1930s bombshell Jean Harlow took lovers during her third honeymoon there; director Nicholas Ray slept with his sixteen-year-old Rebel Without a Cause star Natalie Wood; Anthony Perkins and Tab Hunter met poolside and began a secret affair; Jim Morrison swung from the balconies, once falling nearly to his death; John Belushi suffered a fatal overdose in a private bungalow; Lindsay Lohan got the boot after racking up nearly $50,000 in charges in less than two months. Perched above the Sunset Strip like a fairytale castle, the Chateau seems to come from another world entirely. Its singular appearance houses an equally singular history. While a city, an industry, and a culture have changed around it, Chateau Marmont has welcomed the most iconic and iconoclastic personalities in film, music, and media. It appeals to the rich and famous not just for its European ambiance but for its seclusion: Much of what's happened inside the Chateau's walls has eluded the public eye. Until now. With wit and insight, Shawn Levy recounts the wild revelries and scandalous liaisons, the creative breakthroughs and marital breakdowns, the births and deaths that the Chateau has been a party to. Vivid, salacious, and richly informed, Levy's book is a glittering tribute to Hollywood as seen from inside the walls of its most hallowed hotel. “[An] engrossing account of the L.A. hotel’s 90-year history of decadence. 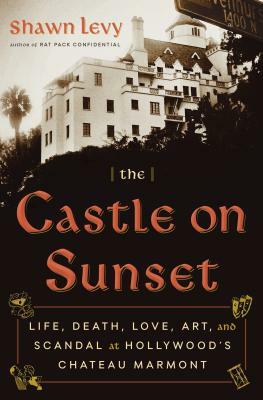 Weaving together historical research and firsthand accounts, the author examines the transformation of the high-end apartment building into a world-famous hotel often inhabited by itinerant Hollywood directors and actors…This eye-popping and entertainingly lurid tale of Hollywood scandal and intrigue will delight readers."